The killer whale, or orca, with ten tons of pure power, is the only predator capable of taking on a large whale. In spring, as gray whales and their calves pass through the narrow bottlenecks between the Aleutian Islands, especially False Pass, there are killer whales lying in ambush. 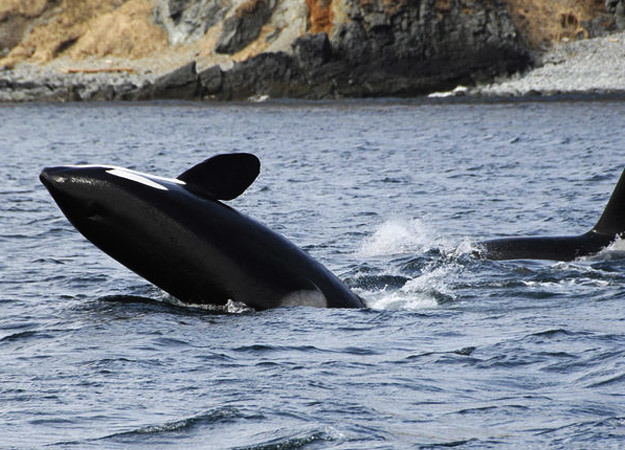 Orcas hunt everything from fish to seals, penguins squid, sea turtles, sharks, and even other kinds of whales. At the top of their list are gray whale calves. The killer whales like to feast on the calves' nutritious tongues and soft flesh, and the Aleutians are among their favorite West Coast hunting grounds. They are clever predators and will chase the mother and calf, sometimes for hours, until the mother is exhausted and the calf is separated from its mother's side and drowned.